Nurses have perfected being in front of a crowd. But behind the scenes exists a world of self-regulation where LPNs are making key decisions to lead the profession. These decisions in the areas of nursing education and practice are essential, creating accountability to the public. 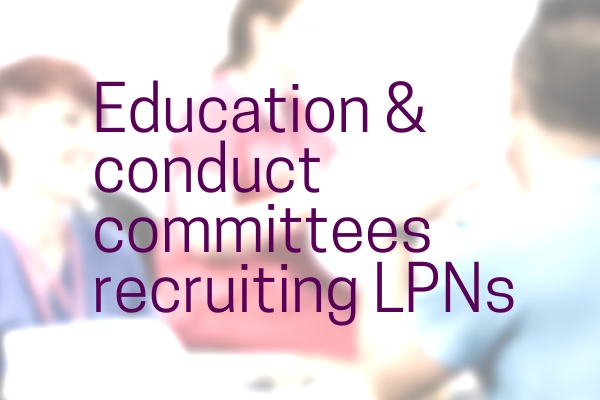 LPNs are invited to submit their resumes for one of four CLPNA Committees. It’s an opportunity to share expertise, boost leadership, and discover new skills. Once approved, your appointment is typically for two years, with a possibility of extension. Assist the Hearing Tribunal and Complaint Review Committee review evidence and make decisions regarding complaints of unprofessional conduct against LPNs. Assist the Jurisprudence Committee in the maintenance and development of our Jurisprudence Examination, a multiple-choice, open-book exam which helps LPNs gain the necessary knowledge to practice nursing safely. Assist the Competence Committee in reviewing and assessing documentation to ensure LPN compliance with the Continuing Competence Program. Orientation, training, honorarium, and travel expenses are provided. Applications are accepted online until November 1, 2018. You will asked to upload your current resume in Word or PDF format. For help, contact info@clpna.com, 780-484-8886 or 1-800-661-5877 (toll free in Alberta).